Oak woodlands need fire, and at Pleasant Valley Conservancy we try to burn our major oak woodland (Units 15 and 16) at least biennially. 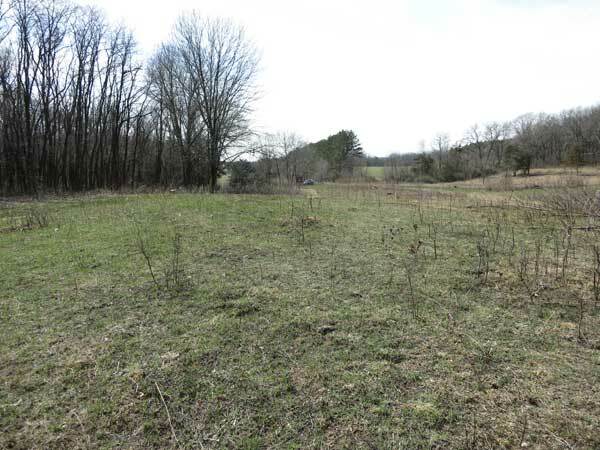 The big burn in November 2016 was fairly successful, but some areas did not burn well, and the County F road cut, which has a lot of good savanna forb species, did not burn at all. 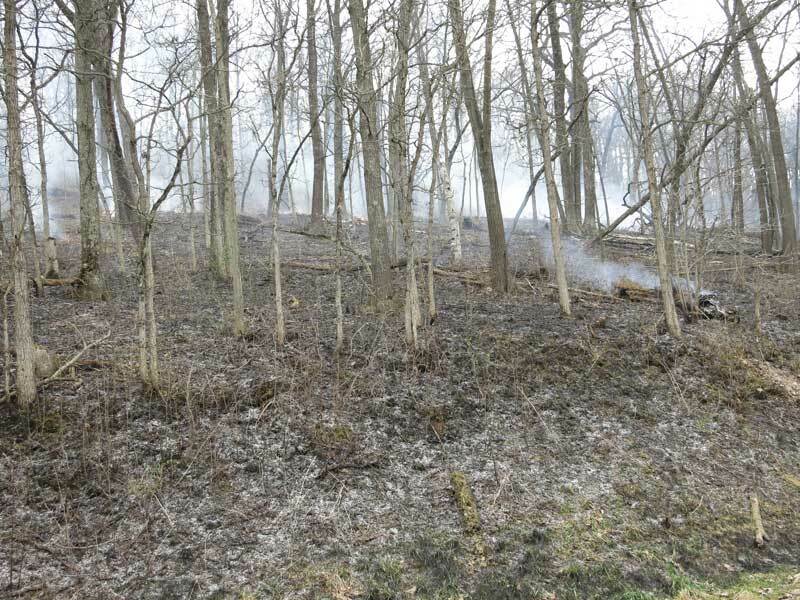 Yesterday, since all of the surrounding units at PVC had been burned, we had no need for fire breaks, and simply lighted from the bottom of the hill along County F. The fire easily moved up from County F into the woods, and in most areas burned through the woods until it reached some barrier. In several areas, the fire line moved all the way to the top of the hill, where it reached the North Fire Break and stopped. This was a two-person burn (Amanda and Susan), with two drip torches and no water at all. (We had water backcans as back up, but they were not needed.) There was a strong wind out of the south, but on this north-facing hill everything was fairly quiet. The temperature was 70 F and the R.H. about 45%. There had been several sunny, windy days, so oak leaves, the principal fuel, were dry and crackly. All that was required is to light along the bottom of the County F road cut and watch the fire move. Fire line moving through the woods from lighting at the bottom of the County F road cut. Looking down from the top of the hill (along the North Fire Break). In this area the fire had moved all the way from the bottom to the top of the hill in about an hour. Zig-zag goldenrod, a woodland species, is an early starter. In this area, the fire went around the patch on the left, but burned the other two patches. 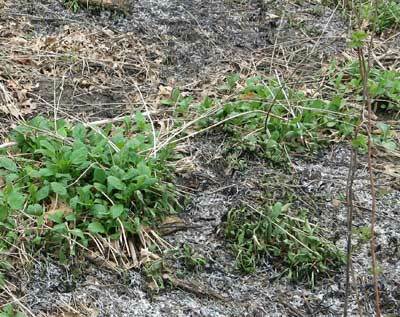 Because this is a low-intensity fire (around 200 C), root buds of the burned patches will soon replace the damaged plants. See more photos on the PVC Facebook page. It is easy to identify a tree as a member of the genus Quercus (“oak”), yet often difficult to distinguish a specimen at the species level. This is especially true for oaks of the section Lobatae, which includes red, black, and Hill’s oak, three species that are prolific at Pleasant Valley Conservancy. To keep things simple, I will call this the “red oak group”. Key taxonomic characteristics of oaks include bud and leaf morphology, acorn shape (including the cap), and bark thickness and structure. If the specimen is a “good species”, the characteristics fit well, and a species name can be attached. But confusion often arises, and this is often due to hybridization. It has been known for some years that hybridization is common in the red oak group, which explains why these species are hard to pin down taxonomically. It seems reasonable that if two or more of these species are growing in the same general area, hybridization might occur. Present day plant taxonomy makes extensive use of DNA analyses, which provide “ground truth” for traditional morphological taxonomy. Since Andrew took up his post at the Morton Arboretum, he has been working on the taxonomy of oaks, using DNA techniques. We had a visit from Andrew in 2010, when he first confirmedthe presence of Hill’s oak at PVC. Later he returned with a research team and sampled a number of oak specimens for DNA analysis. Owusu, Sandra A., Sullivan, Alexis R., Weber, Jaime A., Hipp, Andrew L. and Gailing, Oliver. 2015. Taxonomic relationships and gene flow in four North America Quercus species (Quercus section Lobatae). “Systematic Botany”, Vol. 40(2): 510-521. Andrew’s group studied red oak-group specimens from 17 separate geographic sites in the Midwest. My post here deals just with the oaks he sampled from PVC. The map here is from Andrew’s paper, with a few labels added to indicate the approximate locations where the samples were taken. It shows the distribution of genetically pure, hybrid, and misclassified individuals. Each specimen is shown with the classification originally made based on traditional taxonomic criteria. Symbols with open centers indicate that the DNA data agreed with the taxonomy. If the symbol has a black circle, it means that the DNA indicated that specimen was a black oak but had been misclassified. Those with a black star indicate black X red oak hybrids. Those with a white plus sign are black X Hill’s oak hybrids. with labels added to show the approximate location at Pleasant Valley Conservancy. The table below summarizes the data from this figure. 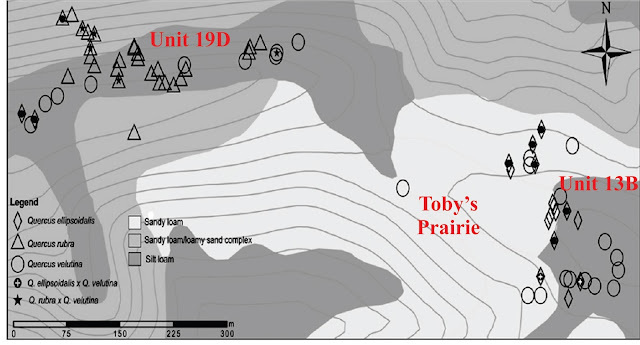 Analysis of hybridization in the red oak group, based on an analysis of 64 specimens from the north and east side of Toby’s Prairie. In sites such as PVC, where all three species are living close together, it is perhaps not surprising that hybrids (based on DNA) are common. A significant number of specimens of Hill’s and black oak had been misclassified (based on DNA). However, the DNA analysis indicated that quite a few tree specimens at PVC were not misclassified. Andrew has now moved on to a study of the bur oak/white oak group, and will be back this summer to do DNA sampling from some of these trees. Generally prairie burns in the fall are not too successful because grass, the principal fuel, has not yet fully cured. However, last fall was especially favorable for curing and prairie burns were quite successful. 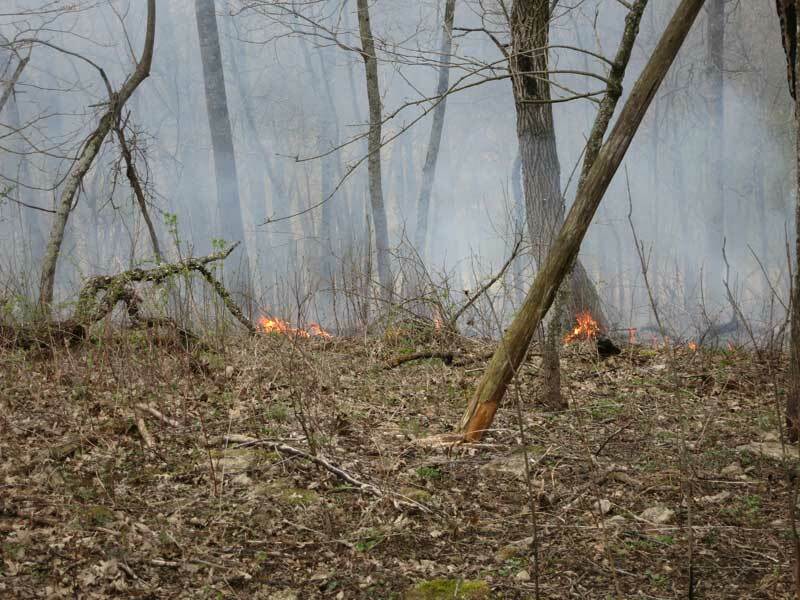 Last fall two outstanding prairies were burned in the fall, thus giving them a “head-start” for this spring: Walking Iron and Black EarthRettenmund. Yesterday, Kathie and I visited these prairies to see how they had responded. Although this has been a cold March and early April, lots of early prairie species were above ground. Pasque Flower Hill at Walking Iron Prairie indeed had quite a few pasque flowers (Anemone patens) in flower, although the major bloom will probably be next week. Pasque Flower Hill at Walking Iron County Park in April 8, 2017. This prairie was burned the previous fall. Lots of new growth scattered across the site, and a few dozen pasque flowers. 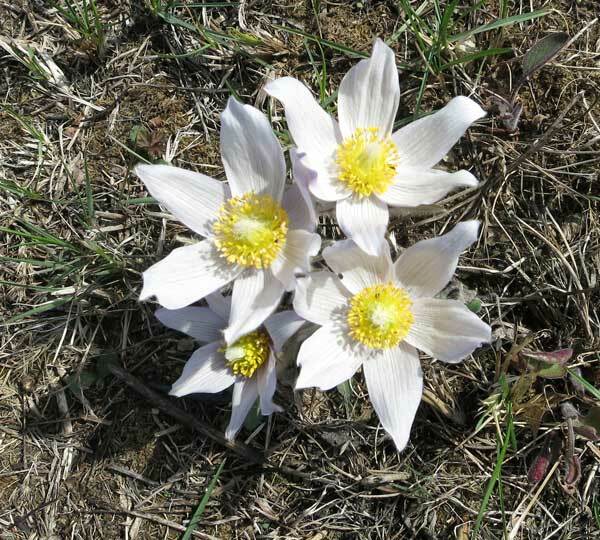 Pasque flower in bloom at Walking Iron. Pascha is Latin for Easter, which is often the time this species is in bloom. Prairie smoke, a species that is especially prolific at Walking Iron. 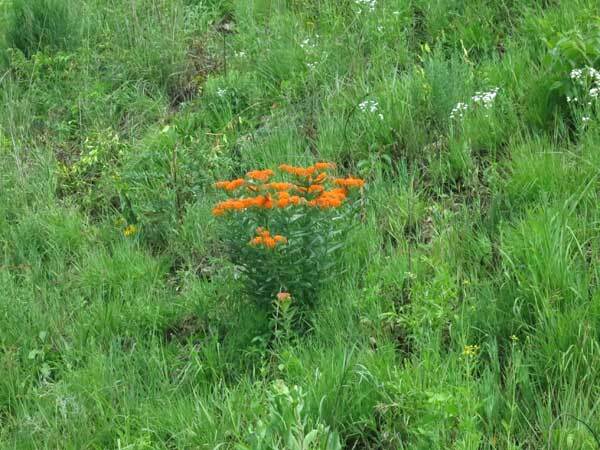 generally found only in mowed lanes or other areas where the vegetation is short. 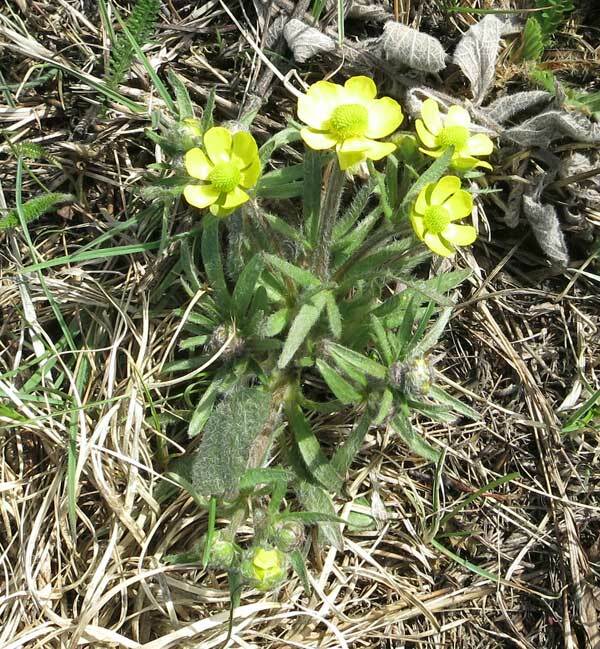 Because of the burn at Walking Iron, all the vegetation is short, so early buttercup is thriving. At Rettenmund, where pasque flowers are fairly uncommon, shooting star shoots were all over the South Unit. 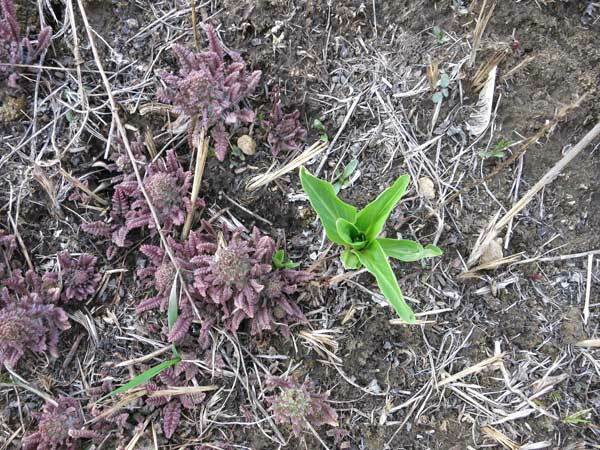 Also, wood betony was in bud everywhere, prairie smoke was in the vegetative state but flourishing, and there were lots of rattlesnake master shoots. From now until the end of October, there should be something new to see each week at these two nice prairies in western Dane County. The little bluestem in our tallgrass prairie is so lush that the underlying growth pattern can’t be seen until it is burned. 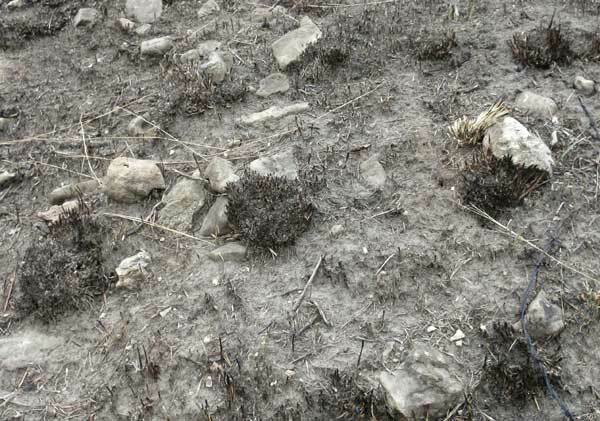 A close look at the burned half of this photo will reveal the individual clumps, which are shown in more detail in the second photo. Fire moving across the South Slope little bluestem prairie. The bluestem clumps are visible in the burned portion. Close up of the burned little bluestem clumps. The distance between clumps is about 12 inches (~30 cm). Little bluestem (Schizachyrium scoparium) is a classic bunchgrass and is widespread in North America. Each individual “bunch” is a complex of tightly joined tillers that arise from buds just below the soil surface. Little bluestem evolved where the fire regime constitutes frequent, generally annual, burns. In the absence of frequent burns, little bluestem grows poorly. On dry sites such as ours, little bluestem grows in separate, erect clumps, with bare ground between plants. Each bunch is a clone, derived originally from a seed. The bluestem clone can have several hundred stems crowded into a patch of 5-10 inches in diameter. Research in Texas has shown that the individual stems (called ramets) of the clone are integrated physiologically, with transfer of resources from older to juvenile ramets. The mature root system consists of a huge network of roots, which spread out from the clump. Although most clones flower, seed production is not prolific, and is not too important in a mature stand. The individual ramets in a bluestem clone are fairly short lived (mostly 2-3 years or less), and new ramets are produced to offset mortality. As new ramets are formed, older ones die and decompose. Long-lived clones often have hollow crowns due to death and decomposition of older ramets in the center. The age of a single clone may be as long as 50 years, but eventually the clone dies. A lot of research has been carried out on the physiological processes by which the bluestem clone grows and maintains itself. Even if seeds of little bluestem are planted in a uniform manner across a field, regular patches develop. It seems evident that clones in a prairie compete with each other for one or more essential resources: water, light, nitrogen, etc. Those clones that get started earlier will have more roots and above-ground plant material to draw on vital resources and will hence win out. The end result is a pattern of clones with bare ground between them. Although each bunch of little blue keeps other bunches away, the bare spaces between bunches are not barren, as other species can grow there. 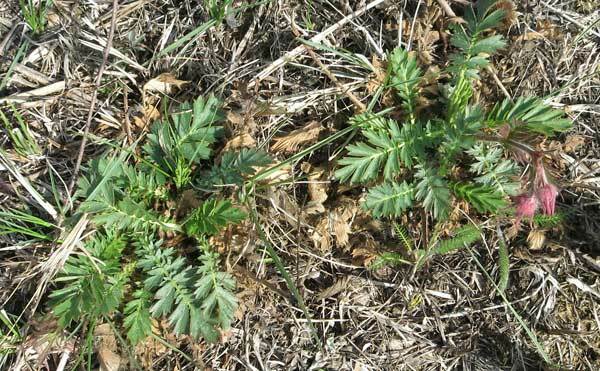 Here are two photos showing prolific growth of prairie forbs in the bare spaces between the little bluestem. 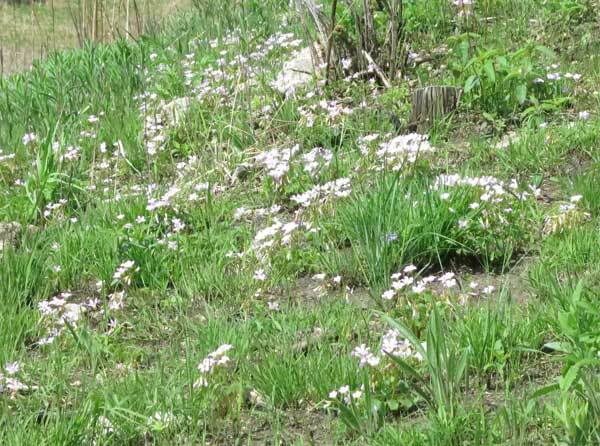 Violet wood sorrel in flower (with other species) among the little bluestem clumps in mid-May, 2014.